Are these not THE cutest shoes you have ever seen? They just might be my favorite item of horse apparel I have ever seen. They are by Weboo Shoes, come in 4 color choices, in youth shoe sizes. These aqua and purple horses are called "Tisha". Weboo states they were looking to bring "play value" into kid's footwear. Epic Win???? At 45$, they are a mighty high price point for my store, so I do not expect to be able to offer them. With the detailing and uniqueness, and range of colors, their price is actually lower than I expected. "Sparkles" In sz 1 and 2 also. 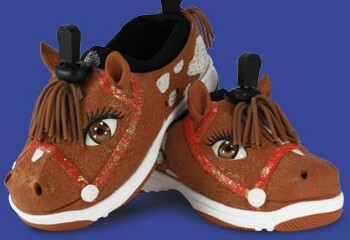 My horse loving daughter thinks they are super cute too, and I just might order a pair to squish her feet into. If they don't fit, we can just play with them! Sorry, none in lady's sizes! How cute! I absolutely love these shoes. 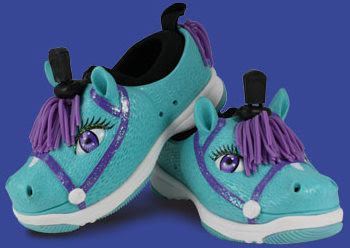 I totally want to buy some of these for my little girl for her birthday next month. She is so funny and she keeps asking for a eous blanket for her horse Glitter. I think I might have to get her both because I don't think I can pass these up. Those are the cutest shoes I've ever seen!!! Adorable!! !